Baked chicken doesn't have to be boring. Oven-baked ranch chicken has a light breading and just enough flavor to be a family-favorite. Easy prep makes it great for dinner guests, too. I've been making oven-baked ranch chicken longer than I've been married. It's that good...and that easy! The ranch provides just enough flavor and acts as a marinade. Place trimmed chicken in a glass or plastic dish with a cover (or even in a zippered bag). Drizzle a few tablespoons of ranch dressing over chicken breasts and spread around. Marinate in the refrigerator for three hours or overnight. Prior to baking, crush Rice Krispies (about 1 cup for 2 breasts) in a closed bag with a rolling pin or the bottom of a drinking glass. Remove excess ranch dressing. Dip chicken breast in crushed Rice Krispies until completely covered. Place chicken breasts in an oiled (or sprayed) baking pan. Bake at 350° for 40-45 minutes. 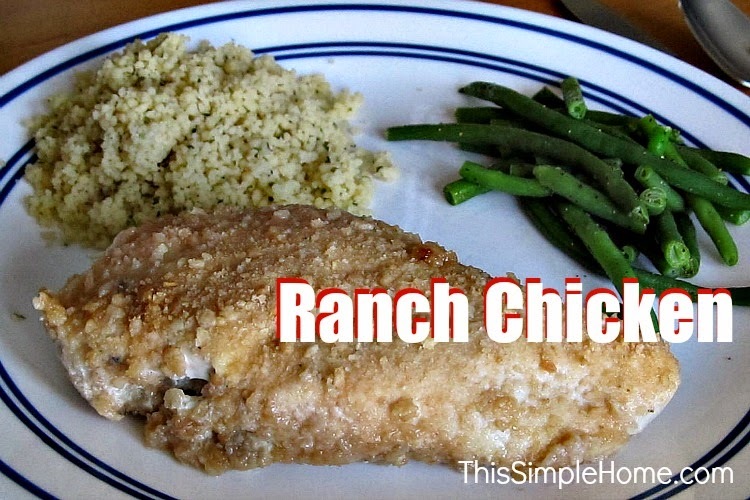 An alternate way to prepare the ranch chicken is by grilling it. If you do this, skip the Rice Krispies. Tip: To cut baking time, cut the trimmed chicken breasts in half horizontally. You'll have two thinner pieces which bake in about 30 minutes. If you like ranch, be sure to try our ranch pork chops and bacon ranch chicken. Both are fabulous and easily prepared in the slow-cooker. I use my homemade ranch mix recipe to make those. What's your favorite way to prepare chicken? Check out all of our easy recipes. Is it wrong to read this recipe at 5am and be hungry? Looks divine! Of course, I'm a big fan of chicken and ranch combo. I've never made ranch chicken before. This sounds simple and delicious! Wow... my aunt used corn flakes mayonaise. I've never heard of rice krispies! I'll try it! Thank you! I've put French fried onions I my chicken like this or ritz crackers or corn flakes but never tried Rice Krispies. I'll have to try it! This looks so good. I'm with Mary and I kind of want some at 9AM. I think I might try the ranch dressing trick this week. Yum! [slaps self on forehead] why haven't I done this before? Oh, that looks good. And easy, which tends to be my #1 criteria in a recipe! :) I suspect you could add a bunch of variations on that - like using crushed stuffing mix, or seasoned bread or cracker crumbs. Looks so so yummy. Who would have thought? Rice krispies! Definitely making those soon and so darn easy too. I've never used rice cereal. Great idea! How unique and wonderful! I can't wait to try it! I was just looking for some ideas for new dinners. This looks like it would hit the spot.